I’ve noticed LINK-11 (TADIL – Tactical Digital Information Link) transmissions in the 6940-6950 kHz region the last day or two. Operators may wish to avoid 6950 kHz, and perhaps even 6955 kHz, especially while these transmissions are occurring. I have no idea where these transmitters are located, but if I had to guess based on propagation characteristics, I’d say maybe Canada or out in the Atlantic. LINK-11 is operated by the US military. I’m pretty sure you don’t want to interfere with it. While conditions may not have been spectacular, I was able to hear a lot of stations. All heard with a JRC NRD 545 receiver and my 635 ft sky loop antenna. 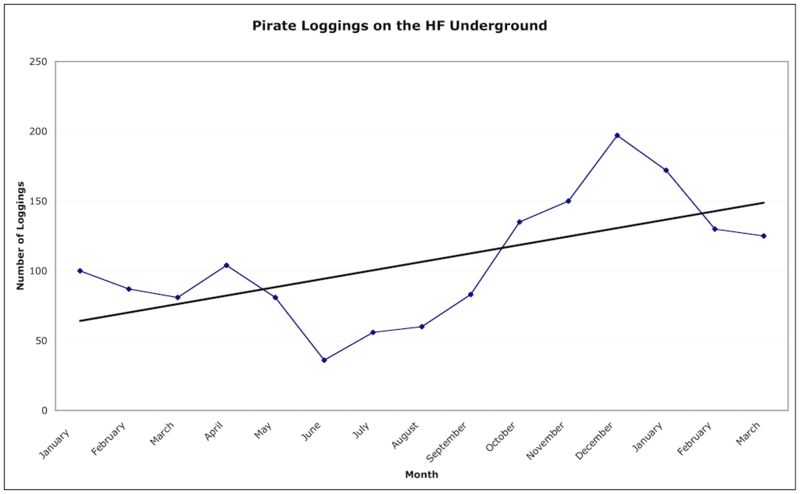 Here’s what I’ve heard so far, all loggings reported to the HFUnderground.com message board. This is a great opportunity to hear a lot of Europirates! Be sure to visit either the #pirateradio IRC chat or Iann’s Chat while the event is taking place, to get current information on what stations are active. Saturdaymorning 08:00 – 10:00 h utc. Saturday afternoon 14:00 (or 14:15) – 15:00 h utc. Sundaymorning 09:00 – 11:00 h utc. Frequency 15.050 – 15.065 MHz, if 15.060 is occupied. WR is on the air every Sunday from 08.00 – 11.00 utc. let’s hope it will be on air for this weekend. Saturday 14.00 – 16.00 utc. at 06.30 – 07.00 and 07.30 – 08.00 utc! Progamme will continue longer if possible. On Sunday 1/4/12 from 08:00 ….. 10:00 UTC on the Dipole intend for Scandinavia and the Mediterranean Sea. On Sunday 1/4/12 from 11:00 ….. 13:00 UTC on the Vertical ant. intend for overseas country,s . On air from 14.00 – 23.00 utc. 1) European MORNING 08.00 – 12.00 UTC from Europe to Asia/Japan/Oceania. 2) European AFTERNOON 12.00 – 16.00 utc from Europe to North America and vice versa. 3) European NIGHT 22.00 – 24.00 UTC from North America to Asia/Oceania. A few weeks ago, I put up a new antenna, a delta loop for 43 meters. Since it was dedicated for a single band, the performance should be very good. My plan was to write a article here about how well it works, compared to my existing antenna, the 635 foot Sky Loop. 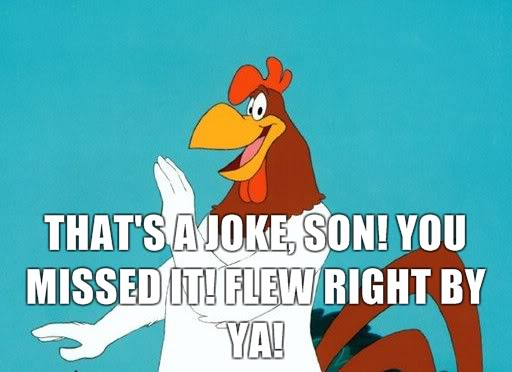 That article never materialized, because… the delta loop doesn’t work any better than sky loop. What went wrong? 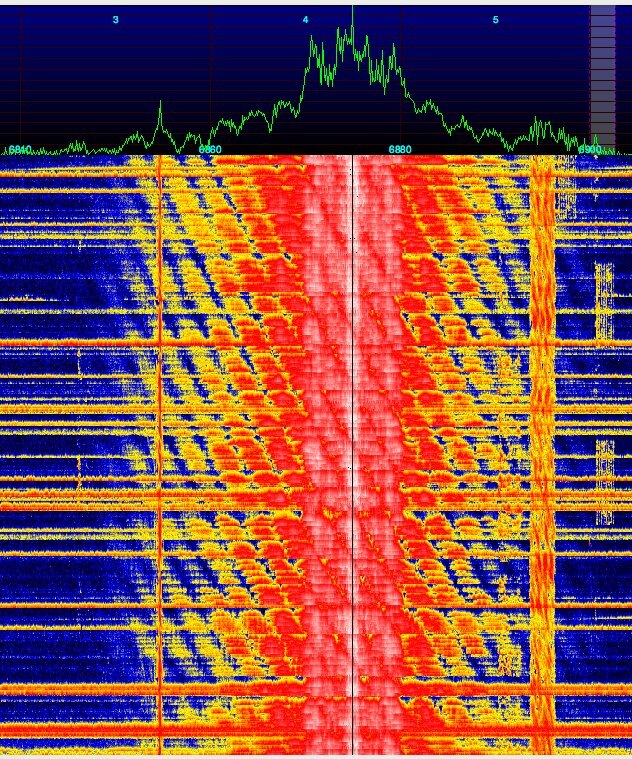 Shortwave listeners, it seems, are addicted to two types of new things: new radios, and new antennas. We’re sure that the latest and greatest radio will substantially improve reception, reject QRM, and let us hear lots of stations we could never hear before. And Software Defined Radios promise to do all this and more (just ask Al Fansome). While a new radio often does offer conveniences and advantages over the old one, usually they turn out to be mostly minor improvements (unless you’re switching from say a portable to a desktop communications receiver, or finally giving up that old analog tube radio for a newfangled solid state rig with digital readout). The same holds true, it seems, for antennas. Sure, if you’ve previously had an indoor antenna, and finally are able to put up your first outside antenna, the improvement will indeed be dramatic. You most likely will hear new stations that you never could pick up before, and the reception of existing stations will be substantially improved. You’ll also end up not hearing some things you previously did, like your plasma TV. And switching from say a 50 foot random wire to a dipole or T2FD will also produce a noticeable improvement in reception. Not as much of an improvement as going to an outside antenna, but still significant. But after that, it certainly does seem to be a case of diminishing returns. When I switched from the T2FD to the Sky Loop, I did notice an improvement in reception, but it was not what one would call amazing. It was better, certainly, and worth the effort. But I went from a 132 ft T2FD to a 635 ft sky loop. Most of the improvement was on the lower frequencies and MW, as one would expect. Reception on the higher frequencies, say above 20 MHz was either the same or worse. Also probably as one might expect. But, like the gambler looking for that last final big score, we SWLs have to try for the ultimate antenna. The one that will let us hear otherwise impossible DX. Like a pirate on 6925 kHz during the daytime transmitting from Montana. Possibly also being heard in New Zealand. To hell with the laws of physics! So I ran numerous NEC models on various configurations of the delta loop, optimizing the dimensions and height for the best possible reception. Ignoring the fact that minor changes in things like ground conductivity cause huge changes in antenna performance. And that I have no idea what the ground conductivity is here, anyway. Plus, it probably changes when it rains. Also, the takeoff angle from the antenna varies quite a bit if you change the height of the antenna by a foot or two. Did I mention that my yard is heavily sloped? But, I did the calculations, cut the wire, shot the fishing line up over the trees to pull up the rope, and installed the new delta loop. Then ran coax to the shack, connected it to the radio, and ran some tests that evening, to see how much better the performance was. It wasn’t. Signal levels were lower than with the sky loop, and more importantly, the signal to noise ratio was the same or worse. Plus, I had an antenna that basically worked for one band, whereas the sky loop is good from MW up. So, I think I’m going to stick with the sky loop. No need to switch antennas, or use an antenna tuner. It just works. Although, if I take the delta loop and reconfigure it as a horizontal resonant one wavelength antenna… hmm… time to run some NEC simulations! We had an M8.4 solar today, commencing at 1715 UTC, and ending at, well, it still seems to be going on, the x-ray flux level is still C3 at 2300 UTC. 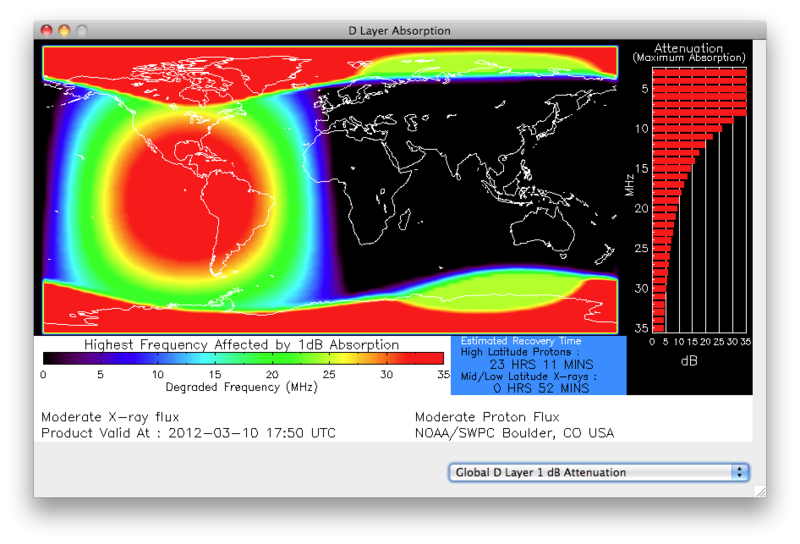 The effects were dramatic, virtually all of HF was completely silent here, just static. 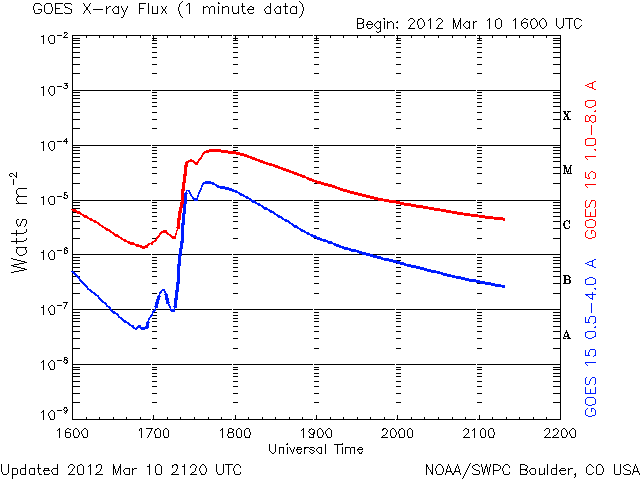 The intense x-rays from the flare caused strong ionization of the D layer of the ionosphere. The D layer absorbs radio waves, it does not reflect them like the E and F layers that we rely on for shortwave propagation. You can view the signal strengths for various frequencies as recorded by my dedicated SDR setup here: http://www.hfunderground.com/propagation Take a look at various stations such as CFRX 6070 kHz and CHU 7850 kHz, and see how they completely faded out during the flare. They also are not present at night, which is normal.